Scio Sphere: The secret ingredient is ... Transitions! Information Technology interfaces have progressed to the point that the core competency factor has become design. Design that is pleasing to see and gives a good feeling, or as many sarcastically call it - 'eye candy'. Call it what you like, if your product has good design it will do well. Talented graphic designers are finding themselves under heavy demand. 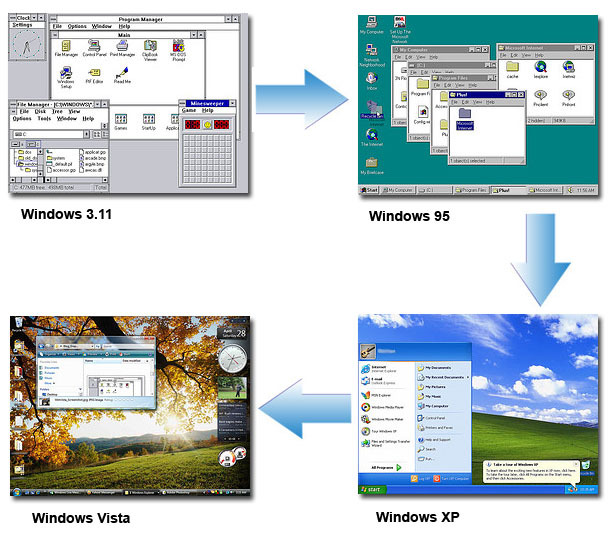 Microsoft does have to be credited with constantly upgrading it's software design - from Windows 3.11 to Windows 95 to Windows XP and now Vista. 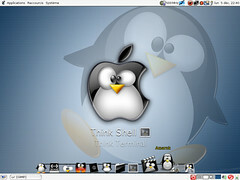 Microsoft Windows Vista's new look is percieved to be largely a response to the design initiatives at Apple corporation. Though I think Linux has also pushed the Vista design team. At Apple corporation the design initiative was initially unleashed on the physical machines with it's new iMac series. Then it went deeper with the Mac OS, which focussed on the software interface itself. Innovative design was invested in creating new interface elements and redesigning the existing ones. The user who's aesthetic sensibilities had been ignored for so long received a happy shock. 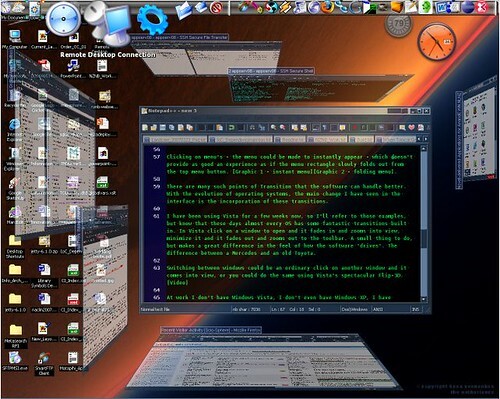 When you are using a computer you'll initiate an action at a time, for example opening a program window. The computer system may also initiate an action. The result of that action will produce a result on your screen. For example, a window will appear or a menu may open. What happens between 1 and 2 is a transition period. How the software fills that time on the screen is what makes a Transition. Ordinarily, there's no need to fill a Transition with any work. Click a button, computer does some processing and a window instantly appears. Optionally a better experience would be to have the software create an animation to make the window appear to zoom in to place, from some corner of the screen. That gives some feeling and space for the Transition taking place. Another common Transition occurs when clicking on menu's. Normally, the menu could be made to instantly appear - which doesn't provide as good an experience as when the menu rectangle slowly folds out from the top menu button, or rolls-out downwards. There are many such points of Transition that the software can handle better. With the evolution of operating systems, the main change I have seen in the interface is the incorporation and enhancements of these transitions. I have been using Vista for a few weeks now, so I'll refer to those examples, but know that these days almost every operating system has some fantastic transitions built in. In Vista click on a window to open and it fades in and zooms into view, minimize it and it fades out and zooms out to the toolbar. A small thing to do, but makes a great difference in the feel of how the software 'drives'. The difference between a Mercedes and an old Toyota. 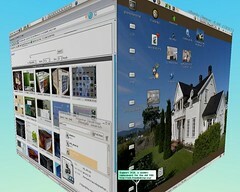 Switching between windows could be an ordinary click-on-another-window-and-it-comes-into-view, or you could do the same using Vista's spectacular Flip-3D. All of these Transitions still work on application events inside the operating system. As more applications move to a web interface, these transitions will need to happen inside the browser. There are already HTML meta tags that are used to create transitions, but these have traditionally been frowned upon. Most of the official movie sites look for a lot of dynamic effects and transitions. As a HTML based site is limited in this area, most of the sites use Adobe Flash interface, which, by the way, is not counted as a standard (for examples see The Inconvenient Truth site, the X-men site). Applications are also moving onto small portable devices, and even there graphics and transitions are providing a smoother and friendlier user experience. It is still tricky business building graphics and transitions into applications using the current developer platforms and technologies. Technologies such as Java never really cared much or helped with the software layout, graphics and transitions. That's due for a change. At work I don't have Windows Vista, I don't even have Windows XP, I have Windows 2000. But that hasn't refrained me from incorporating features such as transparent windows, a Mac OS style dock, and even 3D effects on the windows. Enterprising developers can build any Transition effect plug-in into any level of software. All the windows you see below can actually flip-away to a folded-up view or flip-down to a full-window. The bar on top is like the MacOS applications dock, very handy for launching applications and folder explorer windows. Get the plug-ins here. Hard-core programmers and developers tend to thumb their noses at such not-central-to-the-problem features. However, as mentioned previously - with the gap between the software features narrowing, such design feature differentiators can become the main Unique Selling Proposition. Having a good experience while you work is not to be discounted. In our current technology interface, we work within 2-dimensional (2D) environment that we see on our monitor screen. To alieviate this situation, graphic engines have been added to provide a 3-dimensional (3D) emulation. You can see 3-dimensional objects - such as cars in a game - on your 2D screen. Many of the above plug-ins sought to put in an artistic 3D effect - shadows, light gradients to alieviate that flat experience. Now the experience has been further enhanced by full 3D emulation, making all the 2D elements undergo 3D Transitions - fly around the screen, rotate, distort, animate etc. The stuff you see in videogames are going to be incorporated in the elements of the everyday interface. Transitions are a design trend here to stay. Here's another peek into future Transitions. Most of the software below works in Windows, but I'm sure you could find Linux equivalents - search for Ubuntu or Beryl. The best stuff in life is free! 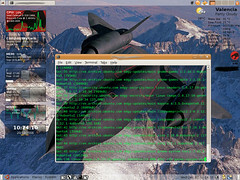 Madotate - A japanese designed software which makes even the windows in my Win2000 computer flip sideways when not needed, as in my desktop above. The small configuration interface is in Japanese but there are English translation documents provided. Transparent Windows - I use these to make my windows partly transparent. You won't feel the need for dual monitor systems. The Amnesty Generator, for you new Vista users. This converts widgets, games and video's on the web to gadgets that can be added to the Vista Sidebar. having all these programs like stardock, addons and plugins is a waste of time because they waste a lot of system resources and cause a lot of conflict witht the program and OS, Damn windows for using DLL. Now if it is already designed into the OS then its great because the programs and any transistions of GUI is smooth without hogging too much system resource. I ask why does Vista need a hi spec machine to pull of GUI tricks when my G4 766 Mhz can pull the same and better tricks on OS X on a DX7 card. Even you had to uprade your video card to get some tricks ed. Not really, as I've mentioned most of these plug-ins are applied in my Windows 2000 machine, which is not a top of the line model, and it hasn't slowed down my machine. I can't afford to have that happen as it's my work environment. My home machine, which has Vista Ultimate, did require a Graphics Cards upgrade (more on that later) and I haven't found a need to implement plug-ins on that yet. As for Apple G4, it is a closed proprietary environment, anybody can control their own system. A real software challenge is to create an open framework which tweaked and enhanced by any developer (See apple user). Beyond Windows and Apples - Linux derivatives are the ones to watch out for - Linux can be made to work on almost any scale of machine with better performance. Note that more that PCs, Windows interfaces are also dominating cellphone OS. Hi Aditya, it's nice article about transitions and there is a lot to it. But in my opinion, it would be completely misjudged to see them as the key ingredient for popularity or desire for an operating system. After all the economical and competitional factors that made Windows big, the success for Mac's is design. But we should understand design as being much more than eye candy. It is about intuitiveness and usability, it is how "things" work and if they look how they work. Transitions on my mac are actually switched off (apart from cover flow). The reason why I so much prefer the mac, is because images in "pages" don't get flipped around as in "word", because iTunes is self-explanatory and you can't find your songs in media player.